Now That You’ve Grown Your Business, What’s Next? It All Depends On What You Call Success. 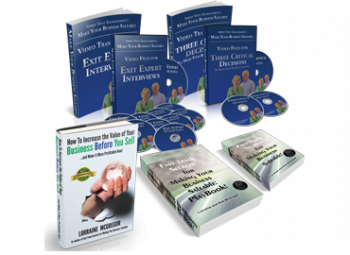 ROI Get a return on his or her investment in all that’s been put into the business. WILLINGNESS TO CHANGE Keep adapting products, services and systems to they serve the needs of customers in a way that keeps bringing them back effectively, delightfully and profitably. EMPLOYEE ENGAGEMENT Create a workplace where self-responsibility drives a culture of can-do people happy to be engaged. LET GO AND GET OUT OF THE WAY Sets the foundations so that the company is transferrable, saleable and not reliant on the owner for any key critical roles. When you’ve aimed at these four goals and achieved them, you’ve joined the 10% club. That’s the number of owners who have actually achieved these goals. He and his partner looked successful before he achieved these goals for all intents and purposes. They live lavish lifestyles, travel the world, sent all their kids through graduate school, own second homes and boats and have real estate worth millions. One day, Bob said to his partner Eric, “maybe it’s time to sell. The company is doing really well and we need to make sure we capture that value before the industry changes again and the company’s fortunes sink.” Bob is a street smart guy. Luckily, Bob and Eric had forged a relationship where they insisted that each have open communication to say the thorny things. It’s what they model with their staff too which creates a vital, enthusiastic workforce able to take on ever bigger projects. So Eric agreed that getting a return on their investment was vital, much as they would want to be able to sell their homes or other real estate to capture the appreciation on the value. They had heard from friends that the first step to selling was to go talk to a broker or a mergers and acquisition advisor (Mistake #1). Bob thought that they would have the business sold within the year (Mistake #2). They were excited to take on this next challenge in their business partnership. They had M&A advisors fighting over them. They assumed this meant finding a buyer would be easy. (Mistake #3). All the brokers thought this multi-million dollar company was ripe for the picking. Together, Bob and Eric spent six months digging up critical information (taking time away from the business which is Mistake #4) to be ready for due diligence. Then the package went out on ‘the street’. 8 months later, I met with Bob and Eric. “Any takers yet?” They both shook their heads solemnly. I went through my mental check list of what we know makes a saleable company. The economy is usually NOT the issue. Question: Did you make your company saleable before you went to find a broker so that you would have certainty that you would get that return on your investment? Question: Are you two still playing a functional role in the business? 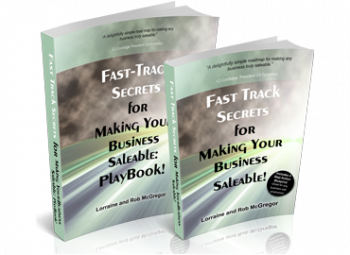 Eric and Bob made a commitment that day to learn what it takes to make their company saleable even though they knew it might take 2-4 years before they would be able to sell it. Why? Because they were focused and intent on getting that return on their investment. Commitment moves mountains. It was frustrating and humiliating to face the fact that no buyer was interested. They did not want to go through that again. So making that commitment was easy. The alternative was to work until they couldn’t one day and then watch the company shrink before their eyes. ROI Decided what they wanted to sell it for so that they would get the level of return each wanted. Learned the keys to making a business saleable. EMPLOYEE ENGAGEMENT Decided to re-organize the company by promoting people into increased responsibility with clear authority and accountability and then mentored them by sharing their knowledge and networks. LET GO AND GET OUT OF THE WAY Created a job description for a General Manager and re-wrote their own job descriptions to have far less involvement in the company. Spent six months searching for and interviewing the best candidate. Offered the GM the option to buy into the company. After four months their new GM suggested both partners only come in once per month. The company grew. The GM became the ideal buyer. Bob and Eric watched as the GM made the company worth what they wanted to sell it for. Were they happy about the fact the GM did the heavy lifting? And the cherry on top? In the deal they get cash now and even more later: How? The partners kept a stake in the company while the GM keeps building on that secret sauce growth strategy. Now they’re getting their first dividend check while they are busy re-inventing themselves in their new lives. WHAT ABOUT YOU? WHAT’S YOUR DEFINITION OF SUCCESS? You are at a fork in the road. Decide now whether you intend to get a return on your investment or you will eventually close it because you didn’t make it transferrable or saleable. You started this company. You’ve grown your baby and have a lot to be proud of. Not many entrepreneurs get as far as you do. Now how will you get your return on your investment without having to sacrifice yourself, your company, your employees or your family’s financial future? 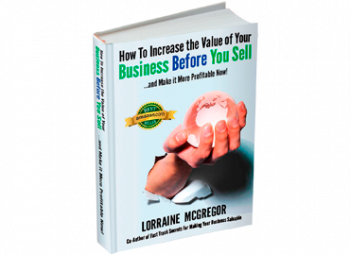 Learn how to make it saleable, long before you need to exit. Your ideal buyer could call you any day. Will you be ready?